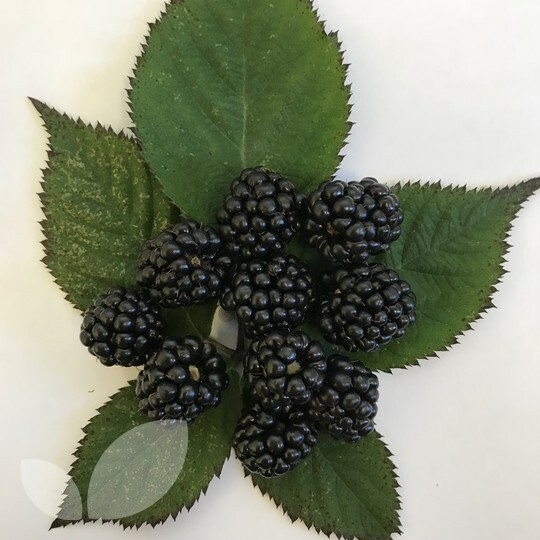 Thornless Blackberry Loch Ness - Currently the most widely commercially planted of any new Blackberry variety, the reason why is the quality of this high yielding variety. Around 3-4 kg per plant can be expected. The fruits are large, very firm and a lovely glossy black in colour. Ideal for planting against a wall or a fence or growing in a container. Ordered a few 9cm soft fruits, this one with a thornless tayberry. Service outstanding as always. We planted these in 40cm pots last autumn and they have grown significantly since then. Lots of new leaves now in March and hopefully both plants will fruit this year. Can't wait! I have been waiting with baited breath for the delivery of my blackberries and raspberries and I was not disappointed. Lovely, healthy plants, great root balls and already budding. Very, very happy with everything I've purchased from Blackmoor so far. This is the first time I have ordered from the nursery and I am absolutely delighted with the two beautiful Loch Ness Blackberry plants that arrived beautifully packaged today. The ordering and delivery service is first class and I shall definitely be ordering again. One very satisfied customer, thank you. Beautiful blackberry plant, full of fruit ready to ripe. perfect condition not a damaged leaf on it. Fantastic! The best online service out of them all thank you. I've recently ordered and received loch ness, oregon and helen blackberries in various forms, all look very healthy plants. First time ordering from you and am delighted with the quality of the plants and the whole ordering and delivery process, plants very well packaged too.